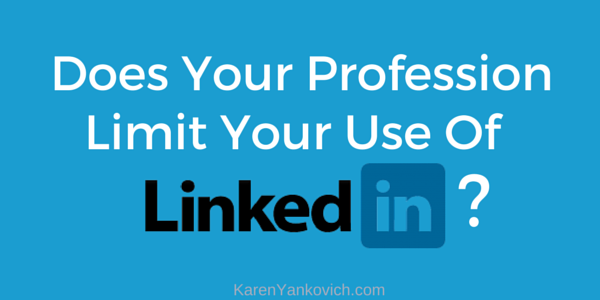 Does Your Profession Limit Your Use of LinkedIn? Anyone who has followed me and this blog for any length of time knows how much I value LinkedIn as a platform to brand yourself as an expert, research and connect with prospects and future partners, and ultimately fill your sales funnel with a steady stream of clients. As a professional, needing to be online and visible, LinkedIn is the best place to be. Network with other professionals in the biz. This is invaluable for information exchange, brainstorming (perhaps) and insight. Showcase expertise in a very neutral space. Here potential clients, potential partners, and possibly future bosses can see what you are known for and good at. Educate the public and thus your future clients through updates, posts, and project sections. Use your knowledge to help others by adding valuable content on the web. One of the most powerful areas LinkedIn can assist professionals is: helping them be accessible and trusted. This one is key especially for careers in law or finance. Prospect clients are looking for who they trust with their money, and often their lives. A professional and polished headshot, a full summary, and a fleshed out profile will go a long way to establishing that foundation right away without you having to lift a finger. However for certain professions there are grey areas to their use of online platforms due to codes of ethics, professionalism, and liability. Lawyers and Investment Advisors are two careers that have strict rules and regs that must be navigated carefully in order to stay within the guidelines. This blog post does not constitute advice in full, I count on you to take responsibility to know and understand your limits within the confines of the regulations under which you practice your profession. But I would like to raise some questions to be sure you answer when looking at your LinkedIn profile if you work in a profession similar to the two named above. Check your specialties, headlines, and descriptions. Make sure if you list expertise in your specialties that you are a specialist in accordance to the law. Some articles advise you remove the term expert and speciality all together from any text on your website or profile. These rules could vary from state to state as well. Be choosy who you connect with on LinkedIn. Invitations to connect with the public who are not in your field could be considered a solicitation and therefore are prohibited under many ethics laws. Check with your codes of conduct or just use LinkedIn solely as a way of connecting with others in the legal/financial field. Do not post/update/tag/discuss anything about a current client. This may seem like a no-brainer but in reality it is much trickier. LinkedIn does not have a feature where it tags your location ie) visiting a client’s office or home, but other social media sites do. LinkedIn does however have many areas that could come with potential conflict such as: interests, updates, projects, volunteer work etc. Just be sure that there is no privileged information nor anything that could lead to privileged information written in those sections. Online communications could fall under attorney-client or advisor-client relationship so be aware of your state’s rules. Most states seem to agree this can be avoided with disclaimers in your social media presence, on your profile, or in your statements that are clear for the general public to understand. Endorsements and Recommendations are in a definite gray area. Many ethics state that lawyers and investment advisors are not allowed to solicit testimonials of this sort, but I have seen profiles of professionals with recommendations. Is it in the solicitation or in the having of these testimonials? I am unsure of the answer, an answer I hope you will know before they show up on your profile. I do know that most recommendations and endorsements come from the giving of them to other connections and therefore not solicited in any way. Please check with your state’s rules to be sure. Regardless of the legalities, LinkedIn still is a fantastic way to showcase your resume, your experience and contact information. It is also a way to foster education, disseminate knowledge and valuable content across the internet at a time when YouTube cat videos go viral. On LinkedIn the value comes from the fact that the general public, a future client, possible employer or employee can find you and see a wide range of of your talents and I’ll say it, your “expertise”, which will help them and help you regardless of the fact that you do no active promotion. As long as your headlines clearly state the nature of what you do, your summary and descriptions are fully fleshed out and every character used to describe what type of law you practice or what type of investment advice you give, the strong search function of LinkedIn and Google will find YOU when someone is looking for just what you can provide. In this day of social media and the power of an online presence, it is important to know what you can and cannot do online, but it is equally important (in my opinion) to still be online fully. Good Luck! For some great reference material and links to articles that were used to research this post, click below. Thanks for the cautionary remarks about how a connection could be construed as a advertisement or solicitation. You can be sure someone can ‘make a case’ for or against another person just because it hit the wrong way or they are jealous. My goodness. People need to be less sensitive and more open-minded about how they relate.